We have a range of swimming classes to suit all abilities. Find out which class suits you using our class self assessment. This is best done on a desktop computer. This short questionnaire is designed to help you find the best suited swim lesson class to enrol into - responses are not recorded/collected. What age bracket is the student? Babies/Toddler Classes use songs, games and activities to teach a variety of skills including entry, floating, breathing and movement. With the parent/carer and child in the water together, the focus is on water familiarization, exploration and safety skills. Swim lesson class placement for children under the age of 3 is based on age. 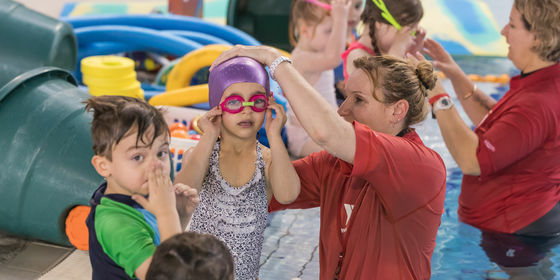 Preschool Classes focus on water confidence and basic foundation skills in swimming, survival and water safety. It guides children through fun activities, gradually building upon their breathing, floating and movement skills, while encouraging independence. Has your child had prior swimming lessons? Is your child willing to put their eyes/face in the water, jump into the pool and return to the side wall without assistance? Can your child do a 5m torpedo / independently swim without assistance? Can your child swim freestyle and backstroke arms for 5m? School Age Classes teach a range of skills and knowledge to develop swimming, water safety, survival and basic rescue skills that can save lives. Focusing on stroke development, it promotes a healthy respect for the aquatic environment and is a solid foundation for a range of aquatic recreation, fitness and sporting activities. Can your child go underwater, independently float on their back and do a 5m torpedo? Can your child swim 5m basic freestyle including breathing and swim 5m basic backstroke? Can your child swim correct freestyle with side breathing for 12m, correct backstroke for 12m, do basic frog kick (breaststroke kick) and confident in deep water? Can your child swim competent freestyle (25m), backstroke (25m) and breaststroke (12m)?